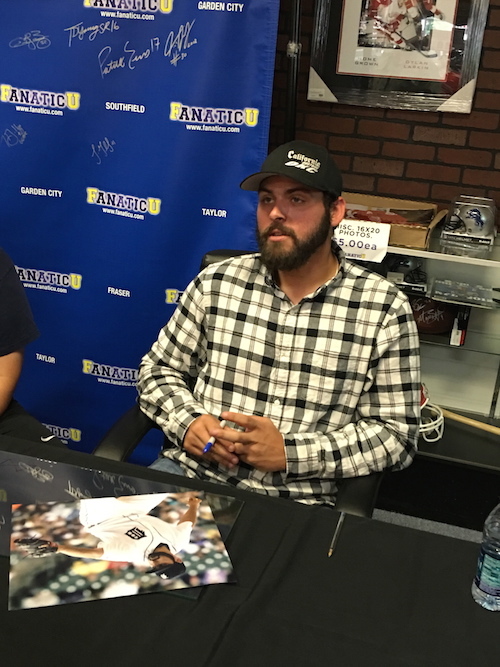 Here is an original photo of Detroit Tigers star rookie pitcher Michael Fulmer signing autographs during a recent appearance at Fanatic U, in the Detroit suburb of Fraser, Michigan. The picture is provided by Lance Martinez from My Detroit Sports. The Fanatic U in Fraser was packed with fans looking to get a Michael Fulmer autograph. Fulmer made his first MLB start on April 29, beginning his career with a remarkable stretch of 33 consecutive scoreless innings. To date, the 23-year-old has tallied a 9-2 record, with a 2.50 ERA and 1.09 WHIP, all amid posting 84 strikeouts, compared with just 30 walks. The Oklahoma native came to the Tigers organization at last season’s trade deadline, as part of the package that brought Yoenis Cespedes to the New York Mets. Talk about a trade that has absolutely helped both teams. Detroit baseball fans can check out iFolloSports.com’s wide array of Tigers related content, via this link.